Summer is cruising along at a blistering pace isn’t it? It’s the speediest of all seasons to be sure and before long many of us will be left with wind chills and blankets of snow to continually clear and drive through, others will face sleet and gloomy skies. It’s not over yet, though, and a new puzzle game is out to help conjure happier times once it is. Swim Out ($2.99) is a clever new puzzle game about a blue-capped swimmer looking to navigate their way through a great many high traffic pools. Happily, Swim Out has the best of all puzzle game traits: It is easy to understand and play. You swipe to move in the direction you wish anywhere on the screen and off you go. It’s a turn-based game, so once you move the other occupants of the pool move as well. If you run into one, or they run into you the game is over and you’ll have to restart the level. There are a bunch of fellow pool and poolside denizens and each has its own movement pattern. The challenge of the game is to predict where everybody is moving and not be there. As you can imagine, this becomes progressively more difficult as the levels advance. New mechanics and swimmers are also introduced as you go. There are beach balls and rescue ring you can throw to immobilize another swimmer for a few turns, divers that splash in and move quickly across the pool, and cannon ballers that send waves your way. Even kayakers make an appearance, in a pool, for reasons. The game does a great job of pacing the introduction of new challenges to keep things continually fresh and interesting. There are over 100 levels, all of which look great and are accompanied by happy summertime at the pool sounds. It’s really quite relaxing. Swim Out is also technically a landscape game, though there is nothing stopping you from turning it to portrait mode for some one-handed puzzling. My main complaint with the game is the lack of undo button which means if you screw up very late in a level it’s back to the beginning. Some levels are on the longer side with multiple pools to move through, so this can be annoying. 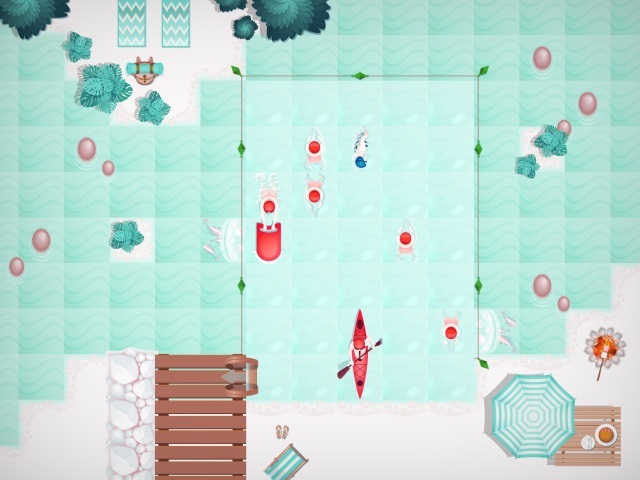 If you’re a fan of puzzle games Swim Out is very likely for you. It’s attractive, intuitive, and fun. It may also bring you a fresh breath of summer for winter is coming. Pick this one up and make sure to head over to our forums for more discussion. Previous PostPrevious Does Gamevice Have a Chance Stopping Nintendo Switch Sales in Their Patent Lawsuit?